The first model developed by MJ Engineering was the Burrell Gold Medal 5 Ton Tractor of 1920, makers number 3846. At the time the original was owned by the Honorable W.H. McAlpine. The working lives of these little engines were invariably hard; as they were capable of being driven by one man, at relatively high speeds. 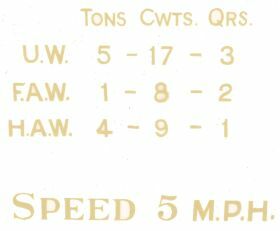 As such they were very suitable for furniture removals, timber haulage & moving building materials. Every effort was made to produce a very accurate set of drawings, together with finely detailed castings, and this set the standard for all of the other MJ Engineering products. Being so completely detailed the model is very much at home sitting peacefully in a display case; however, it is also capable of some very hard work. 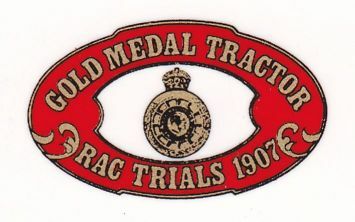 The Burrell Gold Medal Tractor can often be seen on the rally fields pulling their owners around; and, on a good surface, will easily pull two adults. Proof of their authenticity is reflected in the number of awards that they have won in all of the major exhibitions; and in the high prices which they obtain when sold at auctions. Thus the Burrell Gold Medal Tractor may be seen as a good investment. A builders manual is available giving a step-by-step guide to building these models with only basic equipment; such as a 3 1/2" lathe equipped for milling and a drilling machine. There is no need to worry about coping with large turning, as the wheel rims are cast in aluminium in polished metal dies, and require no machining at all. This means that the largest diameter you will have to turn will be the final drive gears which is 6.4". If, however, you decide to buy finished gears from us then the largest diameter will be the flywheel, which is 6" - well within the capacity of a 3 1/2" lathe. Some model engineers have expressed doubts about the strength of aluminium wheel rims, but they are amazingly strong when built up; and, together with stamped spokes, tie plates and strakes, definitely represent the cheapest and easiest way of building wheels. The finished weight of these engines is in the region of 80lbs., so they are not too difficult to move about when they are finished. Speed Limit and Gold Medal water slide transfers. Cylinder Bores and Stroke 7/8" x 1 1/4" x 1 1/2"
Diameter of Boiler 3 3/4"
To satisfy popular demand, we have also provided drawings and castings to enable the engine to be built as a fully authentic Showman's Tractor, incorporating all the details whaich are adrmired by enthusiasts of showland engines. The twisted brass canopy supports (olivers), brass stars and rings, and dynamo are all there. The prototype for this model is engine No 3868, built in 1921 and last used by Arnolds, the Isle of Wight showmen.